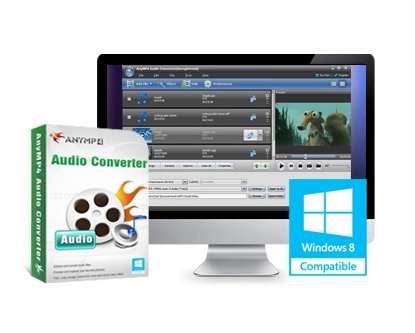 AnyMP4 Audio Converter, the best and easy-to-use Audio Conversion software for audiophiles around the world, has the powerful converting function to convert any audio format as you like, including MP3, M4A, MP2, AAC, AC3, AIFF, AMR, AU, MKA, ALAC, FLAC, WAV, WMA, M4B, AUD, MKA, AIFC, CAF, MPC, and QCP, etc. Also you can add popular video files to convert video to audio your need, and extract the audio file from any favorite video with this versatile Audio Converter software. Convert any audio format like FLAC, MP3, AAC, WAV, ALAC, M4A and AIFF, etc. Are you annoyed that rows and rows audio files you downloaded on the video/audio sharing sites can’t play on your players and portable device? The reason is that every player has its own supported video and audio formats, namely, it can only play well for the compatible audio formats. To free you from the restrictions of listening to the music and sound files, and you can enjoy them on any media player including MP3 players and computers, an Audio Converter is essential. AnyMP4 Audio Converter integrates multiple functions to help you handle any audio file format whenever and wherever you go. Audiophiles can use it to convert any audio file to their needed audio like FLAC to MP3, AMR to MP3, FLAC to ALAC, and FLAC to iTunes/iPod, etc.